The performers at the Festival's closing night party included David Torrens, Haila, Vania, the group A Otro Tiempo and the outstanding rock violinist Ara Malikian (shown on stage). 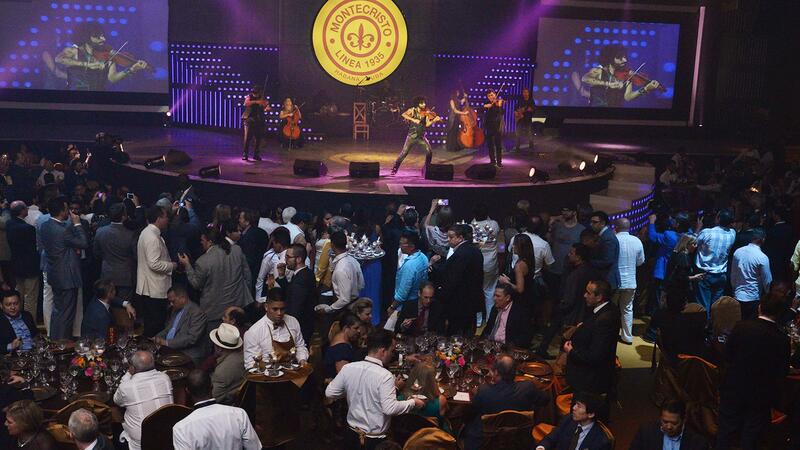 A crowd of 1,200 in suits and tuxedos cheered Friday night as an auction of seven custom humidors, each dedicated to one of Cuba's top cigar brands, raised 1.265 million euros ($1.34 million) in the closing spectacle of the 19th Festival de Habanos in Havana. All the funds raised were donated to the Cuban public health system. The Festival's closing night party, an affair where all who gathered were free to puff cigars before, during and after dinner, also debuted the new Montecristo Linea 1935 line. The new, ultra-premium addition to the Montecristo brand comes in three sizes: the Leyenda, which measures 6 1/2 inches by 55 ring gauge; the Maltes, 6 by 53; and the Dumas, 5/18 by 49. The cigars are blended to be stronger than the usual Montecristo, and they have an additional band with the Linea 1935 logo. A small box containing each of the sizes was given to each diner and more Montecristos were passed out throughout the evening. Cuba's PabExpo convention hall was decked out with flowing white ceiling drapes and large photos of the new Montecristo brand icon splashed all over the walls. While it was a Montecristo night, Cohiba was the top-priced humidor with a winning bid of 380,000 euros ($403,000) by Leander D'Silva of Apéro, a global private member buying club that is part of a Toronto investment firm. D'Silva was an active bidder, and went home with three lots. The humidor's modern columns and bright yellow and black colors were topped by a fantastical golden Taino Indian head. The humidor came packed with 580 Cohiba cigars, including 20 each of the prized Behike BHK52, BHK54 and BHK56, as well as 20 Robustos Supremos, 20 Cohiba 1966 EL from 2011 and 25 of the new Majestuosos. 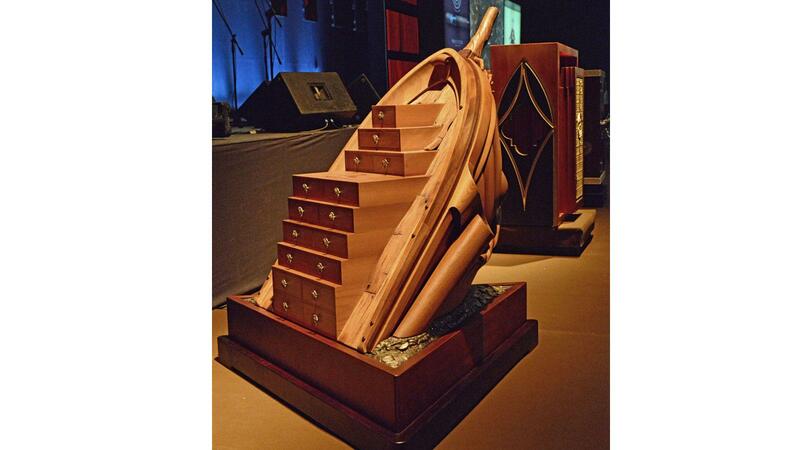 The Montecristo humidor, which looked like a sculpture showing the bow of a wooden boat climbing out of the sea, received the second highest bid of 220,000 euros ($233,000). The dramatic piece held 450 cigars, including the three new vitolas of Monteristo Linea 1935, the famed Montecristo No. 2, the rarely seen Montecristo Double Corona and other gems like a Montecristo Especial No. 1 and the Maravilla No. 1. Mohamed Mohedi, one of the leading importers of Cuban cigars in the United Arab Emirates, was the winning bidder for the humidor. The H. Upmann brand was represented in a beautiful wooden rendition of a bank vault. The hammer dropped at 200,000 euros ($212,000) with a final bid from Dag Holmboe, the CEO of the Pacific Cigar Company in Hong Kong. The 350 cigars inside included 50 Sir Winston Churchills, 20 H. Upmann No. 2s, 20 Royal Robustos, and the four Magnum sizes: 46, 50, 54 and 56. A humidor dedicated to the Romeo y Julieta brand brought in 150,000 euros ($159,000). The design called upon allegories from the Shakespeare play and housed 370 cigars, including famed Churchills, Short and Wide Churchills, Fabulosos and Julietas. Ricardo Cases, the director general of Maori Tobacco of Andorra and the son of Jose Cases, who has been a top Habanos cigar distributor for decades, had the winning bid. The Montecristo humidor, which looked like a sculpture showing the bow of a wooden boat climbing out of the sea, received the second highest bid of 220,000 euros ($233,000). A Hoyo de Monterrey humidor raised 100,000 euros ($106,000), and had 360 cigars in it, including the iconic Hoyo de Monterrey Double Corona. A Bolivar humidor, the first of its kind in the Festival's history and the first humidor auctioned off, sold for a winning bid of 90,000 euros ($95,000). Inside were 345 cigars, with a selection of, among others, Corona Gigantes, Libertadores and Belicoso Finos. Both were purchased by D'Silva, who also bought the Cohiba humidor. A Partagás humidor, filled with 400 cigars, highlighted by the Lusitania Double Corona, the unusual 109, the Sobresaliente and the Serie P No. 2. It sold for 115,000 euro ($122,000) to Vancouver, Canada, businessman, Peter Giannoulis. The three humidors that drew the highest bids were all designed by the craftsmen at Humidores Habana, led by creative director José Ernesto Aguilera. Before the auction, which was conducted by journalist Gary Heathcott, the crowd had been treated to an extraordinary evening of top Cuban musicians and dancers. The performers included David Torrens, Haila, Vania, the group A Otro Tiempo and the outstanding Spanish-Armenian rock violinist Ara Malikian, who performs around the world. The audience was also entertained by the stupendous percussion dance troupe, Compania de Lizt Alfonso. The dancers and singers were accompanied by the Orquesta del Maestro Patterson. After the auction ended, small groups of men and women lingered in the grand convention hall, puffing away on cigars, clutching bags filled with the featured cigars of the evening, and saying goodbye until next year to friends who had traveled from around the world for the event.